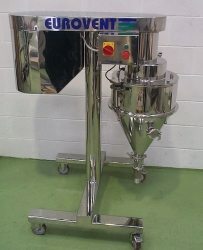 The latest in the Eurovent range of equipment is the PSM Product Sizing Mill. Designed to the latest GMPs with all contact and non-contact parts manufactured from 316L Stainless Steel. The PSM has a multiple blade design to give high performance milling and can be rapidly dismantled for product change and cleaning validation. The PSM has a 360º Mesh to gain maximum uniformity, eliminating dead areas, overworking and creation of fines. Fully welded meshes eliminate product entrapment, with various mesh sizes to suit most applications.